National have every reason to be worried because most polls tend to favour them and their results are probably always at the top end of the margin of error. Their 51% result was more likely to be around 47% which is the highest that they have ever achieved in a general election over the last few decades. This probably means that the latest result is likely to be around 42% in reality. The only party that they could possibly form a coalition with is New Zealand First and they are languishing on 3.5%. For the first time the attention is away from the the leaders of the two largest parties and the focus has been the Ministers and MPs behind them. John Key is a popular Prime Minister but his lack of decisiveness in dealing with his struggling Ministers and his past support of Banks and Dunne is becoming a concern for many. He has also had his successful visit to China muddied by revelations of his own dodgy connections with Oravida and the $56,600 golf photo. National will need more than an upturn in the economy to reverse their current image of conflicts of interest, coverups and incompetence. Our success with our dairy and timber exports probably would have happened under any government and everything that they have been directly responsible for is looking a little rotten. Bill English's reputation took a hit when he appeared to have no real ideas in how to manage the Auckland property boom and limit increases in interest rates. It appears that we will get by through another asset sale and hoping we can muddle through. His ongoing mantra about balancing the books looks even more distant with a drop in tax revenue when the economy is supposed to be improving. Mr Fixit, Steven Joyce, still hasn't fixed the Novopay debacle and the government has spent $33 million in trying to do so. Judith Collins' arrogance has not served her well when dealing with an obvious conflict of interest. She cannot keep passing off her meals and meetings with border control officials and company heads as casual get togethers with 'very good friends'. It is clear that the relationships between Government Ministers and Oravida is well beyond what was ever implied with SkyCity. Many commentators struggle to understand why Collins hasn't offered her resignation when other Ministers have done so for less. Hekia Parata has had so many backdowns and miss-steps that many are surprised that she has remained in charge of the education portfolio. The class size policy failed, Novopay was taken from her, two court cases found against her decisions, National Standards are still not embedded, her Education Ministry head resigned and she can't even convince the sector that an injection of $359 million into school leadership will be useful. Her management of the Kohanga Reo Trust concerns displays incompetence beyond belief, especially when the terms of the investigation didn't even cover the key issues. Gerry Brownlee's bluff and bluster impresses no one as he bumbles through his management of the Christchurch rebuild and the flawed processes he uses to determine the worth of his $12 billion motorways. Tony Ryall has managed to get on reasonably well with his health portfolio until Kevin Hague discovered his inaction regarding potential fraud and the revelation that the celebrated increase in surgeries and supposed reduction in waiting lists had been created through dangerous cuts throughout the system. Amy Adams is struggling to defend herself from the conflict of interest charges made against her as more comes out about her involvement with the removal of ECan and her family connections with Central Plains Water Ltd.
Simon Bridges has failed to present a reassuring presence when defending the Government's support of deep sea drilling. His shrill, slightly hysterical interview on Campbell Live was disconcerting for many. Paula Bennett still refuses to measure child poverty or accept more needs to be done as every statistic related to it points to an increasing problem. Tim Groser is more interested in being a member of the 'Big Boys Club' then genuinely looking after New Zealand's real interests. 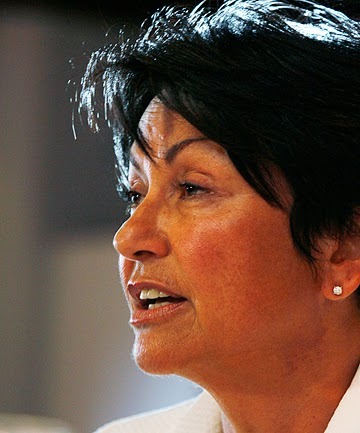 Anne Tolley's personal and clearly racist attack on Metiria Turei was extraordinary as was the support she received from Judith Collins. Metiria's TV tour of her $130,000 two bedroom castle revealed the nonsense behind the accusations. Now that the attention has shifted from the style of leadership to the broad competence of the different parties a different image is emerging. Labour has been looking more assured and competent. While Shearer appeared to struggle as leader he would make a solid Foreign Minister, Grant Robinson impresses every time he speaks and Chris Hipkins has Parata struggling with his questions. The Green Party also look very strong as the overall competency of the Green MPs continues to impress. Many voters could probably name more Green MPs than National ones such is their high profile on regional and national issues. A Labour/Green coalition is actually looking more reassuring than the rather seedy and desperate image emerging from National and their increasingly extreme coalition partners (Act, Conservatives, Dunne). All Green Party policy announcements over the last few months have been financially modest but would potentially making a noticeable difference to the lives of ordinary New Zealanders and surely that is what real governance should be all about. The Royal Society of New Zealand has also just released a report that supports a shift to a greener economy. I think this is the beginning of the end of 'governance through corporates' as voters become more aware of what the Government has really been up to and how little they have benefited. Shouldn't that be a Green/Labour co-olition Dave? Not a mention of the TPPA though. It holds benefits only for oversea corporates. Would Labour would let this slide? Dan, when I attended last year's CTU conference it was noticeable that the delegates were not impressed with Labour's support of the TPPA. We need to keep the pressure on with this. How much of this self-serving, venal behaviour will the public tolerate? The better answer, Dave, to Paul Bailey's question is, yes. Cut to the chase, brother! have you learned nothing from Key?